Over the past week we were given new evidence of what many assumed for years. Former president Barack Obama and his administration weren’t interested in bringing peace to the Middle East. They were interested in harming Israel. Rice said the US would oppose any deal that it felt didn’t do justice to the Palestinians. Rice’s statement showed that Western pressure for Israeli concessions to the PLO isn’t geared toward making peace between the parties at all. It is about retribution. Obama’s anti-Israel vision of justice for the Palestinians was revealed in another story Gold told the paper. Gold related that after Obama and his entourage left Israel following former president Shimon Peres’s funeral last September, Obama phoned Prime Minister Benjamin Netanyahu from Air Force One. He told Netanyahu that if he wants to have a funeral like Peres’s, he needs to get moving with the Palestinians. In other words, Netanyahu told Obama that the US leader’s understanding of what Israel needs to do to bring justice to the Palestinians involves Israel ceasing to exist. Today, as excitement abounds in Israel about the new, friendly administration of President Donald Trump, we must understand what we just went through with Obama. Obama’s vision did not die with him. Thanks to his leadership, the Democratic Party is now anti-Israel. The millions of protesters who took to the streets throughout the US last Saturday voiced their opposition to Israel with the same enthusiasm and passion as they voiced their support for open borders. Moreover, the American establishment supported Obama’s positions. Obama’s hostile policies were roundly supported by the State Department’s permanent bureaucracy. The diplomats who worked with Obama are still in place. So, too, the Washington establishment, including US Jewish leaders, still support Obama’s policy of backing the PLO against Israel. Harris was joined in his campaign against Jewish property rights by former US negotiator Dennis Ross. Ross published an article in the New York Daily News where he argued that Trump should limit his support for Jewish property rights to the so-called “settlement blocs.” In so arguing, Ross invited Trump to reject the property rights of 100,000 Israelis who don’t live in the so-called blocs. Ross effectively called for the new president to support a plan that would require their mass expulsion from their homes and the destruction of their communities. Ross’s fellow mediators used the past week or so to lobby against Trump’s plan to keep his promise to move the US Embassy to Israel’s capital city. Speaking to The New York Times, David Makovsky, who was a member of former secretary of state John Kerry’s negotiating team, and Aaron David Miller, who served as Ross’s deputy in the Clinton years, both said that Trump should not move the embassy to Jerusalem. Last Wednesday, Trump he told Israel Hayom that he intended to keep his campaign promise to move the embassy. The next day Trump’s spokesman Sean Spicer told reporters to “stay tuned” on the embassy move, intimating that an announcement could come as early as Trump’s first day in office. On his first full day in office, Trump moved boldly to overturn Obama’s policies. He signed executive orders that effectively ended Obama’s environmental and health policies. But he ignored Jerusalem. And Spicer made clear that the early plan to move quickly on the embassy has been abandoned. At his press briefing Spicer wouldn’t even commit to moving the embassy before the end of Trump’s term of office. In other words, the Washington establishment won and Israel lost. To be sure, the peace processors and the leftists weren’t alone in their opposition to the embassy move. The Arabs also voiced their disapproval. PLO CHAIRMAN Mahmoud Abbas and his deputies threatened to open a new terrorist offensive against Israel and destabilize the Middle East if Trump kept his promise. Jordan’s King Abdullah reportedly threatened to withdraw his ambassador from Israel and suspend his security ties with Israel. Egyptian President Abdel Fattah al-Sisi reportedly voiced opposition to the planned move as well. But as former CIA director Gen. David Petreaus said during his visit to Israel this week, in recent years, the Palestinian issue, which was once the top concern Arab leaders voiced in their meetings with US officials, became a minor issue for them. Trump’s abrupt about-face on the embassy move makes clear that now is no time for Israel to tread lightly. To the contrary. As the government takes the first steps toward forging its relationship with the new administration, two basic truths need to inform its decisions. First, in light of the hostility of the US Left and establishment alike to the notion that Israel is America’s ally, and given the speed with which Trump backed away from his promise to move the embassy to Jerusalem, the only way Israel can expect to be treated with respect is to command respect. And you can’t command respect when you beat around the bush about your vital interests and rights. Second, Israel cannot expect Trump to abandon Obama’s hostile policies in relation to the Palestinians if it doesn’t abandon them first. This means Netanyahu must heed his government ministers’ calls to abandon the two-state paradigm. So long as Netanyahu continues to support PLO statehood even to a limited degree, he gives legitimacy to the wholly anti-Israel PLO narrative. 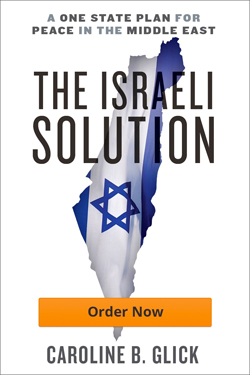 Right after Trump was elected, government ministers from Bayit Yehudi and the Likud implored Netanyahu to abandon the two-state formula and apply Israeli law to Area C in Judea and Samaria. Under pressure from Netanyahu, who himself was under pressure from Obama, the ministers quickly ended their calls. Obama’s decision to enable the UN Security Council to pass Resolution 2234 brought the two-state paradigm to its inevitable conclusion. The resolution criminalized Israel and legitimized Palestinian terrorists. After the UN resolution passed, and as Trump’s inauguration approached, the ministers renewed their calls to end support for Palestinian statehood and replace the two-state paradigm with the paradigm of Israeli sovereignty. But pressured by Netanyahu, they scaled back their calls for Israeli administration of Judea and Samaria to a minimalist call to apply Israeli law to the city of Ma’aleh Adumim. Over the weekend, calls for action grew louder. But on Sunday, just as Trump was backtracking on the embassy move, Netanyahu prevailed on his ministers to postpone consideration of their bill on Ma’aleh Adumim. Netanyahu exhorted them to allow him to run Israel’s policy toward the Palestinian and toward the Trump administration. Netanyahu’s mantra this week has been that he doesn’t wish to surprise Trump with a big Israeli initiative. He insists that a new policy toward the Palestinians needs to be coordinated with the US administration. Netanyahu also says that he continues to support a Palestinian state. But his vision involves establishing a state too weak to threaten Israel. Trump’s sudden about-face on Jerusalem shows the weakness of Netanyahu’s gradual and careful approach. As Netanyahu preached caution, Israel’s opponents in the US worked hand in glove with the Palestinians to draw Trump into the anti-Israel logic of the “two-state” policy. The situation isn’t lost. Even as he backtracked on Jerusalem, Trump has taken other steps that make clear that he really is a friend of Israel. Due in large part to the UN’s hostility toward Israel, Trump moved resolutely to scale back US support for the UN. Trump also overturned Obama’s last minute decision to give the Palestinian Authority $221 million. Moreover, so long as he supports the “two-state policy,” every supportive move Trump makes will be easily reversed by a successor administration. And it would be irresponsible, indeed reckless, for Israel to assume that Trump and the Republicans will maintain the upper hand in US politics indefinitely. Eight years ago when Obama took office, the Democrats controlled both houses of Congress. Pundits were near unanimous in the view that the Democrats would remain in power for a generation as the Republicans, smarting from their losses were fractured and leaderless. Two years later, the Republicans won control of the House of Representatives and for the final six years of his presidency, Obama was unable to get his policies through Congress. Netanyahu is right. Israel shouldn’t surprise Trump. But Israel must move immediately to take advantage of the time it has with Trump in power, and with the Republicans in control of Congress to ensure our interests in Judea and Samaria and to rally Trump to support our policies. Time is of the essence. The one Obama legacy that is most likely to be lasting is his transformation of the Democratic Party into an anti-Israel party. His deep hostility toward Israel will likely be shared by his partisan successors. And again, as Israel treads lightly, its opponents scored a victory. If Netanyahu doesn’t seize the moment, the opportunity we have today will quickly slip away.